Finally, a somewhat relaxed and regular week, but only because I fell ill! The cold rain got me as soon as it started and I’ve battled a serious cold for five days now. Luckily, after countless cups of tea and kippensoep (chicken soup) I am almost completely healed. Zoethout tea, which I bought based on some purplish flowers on the box and not the name, is actually liquorice tea. I’m not surprised that I like this at all, I thought it tasted so normal, but Nat came over and thought it was magical. After looking up the Dutch name online and finding it on websites such as “Things Dutch People Like,” we realized we’re picking up some cultural norms without even knowing it! Nat and I also found a coffeeshop where we are now regulars (after two visits, so that shows how small our neighborhood is) with amazing iced coffee. Bagels and Beans. Basically a Starbucks but not a Starbucks, so I don’t feel guilty. Haven’t been to one here, so maybe I’m not the typical American that is caving into my comfort foods. Sidenote: we did go to McDonald’s last night where I had a cheeseburger, but I also had a banana milkshake which don’t exist at McDonald’s in the US! Mickey D’s here also has stroopwafel mcflurries which are incredible. Look at this old man outside of Bagels and Beans! He was smoking a cigar too. 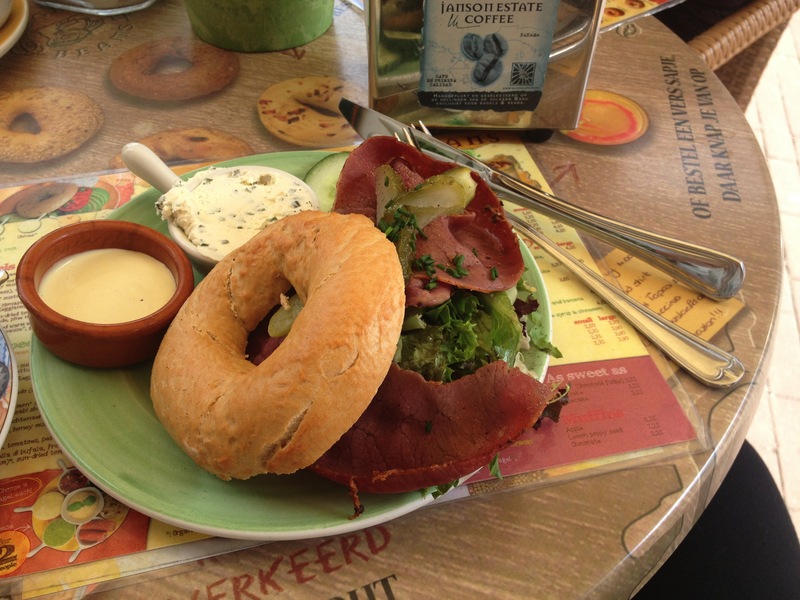 An amazing pastrami bagel. Not Dutch, but still amazing. I thankfully didn’t have to miss any classes and even got some exploring in; by exploring I mean learning the bus route to Science Park because biking in a cold downpour was not exactly what I wanted to do with an aching body. My friend that was an exchange student at Hockaday for a year from Lithuania, Gaby, told me that biking in the rain is the only way to build up immunity! I’m from Texas, and if not there, California, both of which don’t have cold rain or huge biking cultures. I’m giving this period of illness to myself as culture/weather-shock and therefore a freebie. Immunity building will start now. On one of my worst days, I received my first package while here! Emily, my great friend from Claremont Graduate University, sent me a fabulous Moleskine planner, card, and picture for my wall. I opened the door in the pouring rain to be greeted with a little bit of California sunshine. Love love love mail, so feel free to email me and ask for my address! 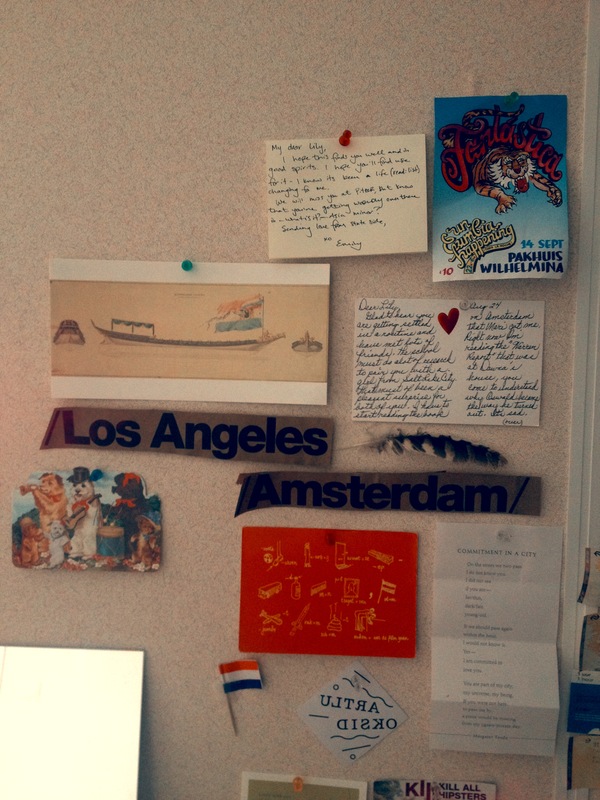 My mail (and random things) wall, always waiting for new additions! I am absolutely in love with my Dutch classes. Although three hours is a long time to take in a confusing language, I really enjoy it and Dutch is so much more simple than the last language I learned–Russian–so, so far so good. We have a lot of work, but I gain the respect of my Dutch peers immediately when I tell them I’m learning, so the faster the better. They’ll help me practice also. Since I was stuck in my apartment when I wasn’t travelling to class, I had plenty of time for homework and Dutch exercises. I biked to my Dutch class on Thursday night because I was already feeling better. Biking at night is so nice. The air is fresh, barely anyone is out and about on my route from Spuistraat to my neighborhood, and you can see the city surprisingly very well. Last night was Pål’s birthday, so we gathered at his room for pre-drinks and celebration. I love that I’m still close with the people I met the very first day. It’s comforting. Since I was finally feeling better, Nat, Jas, Devon, and I decided to do some night exploring to another bar pretty much only known by locals. 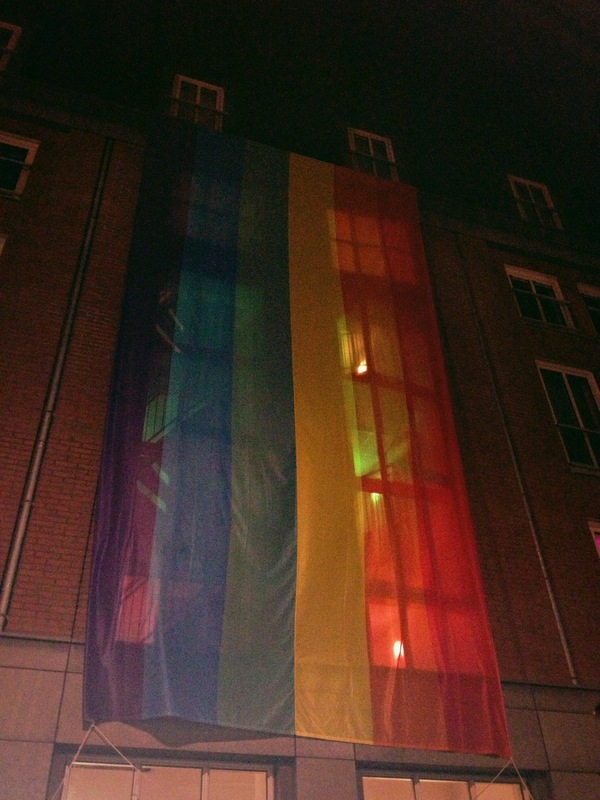 Before we got there we heard crazy loud music coming out of a side street and found an Amsterdam gay pride festival/parade/celebration that we just had to stop by. This always happens to us. We end up stumbling upon the most random places and see a side of Amsterdam we weren’t expecting; I guess we were kind of expecting to see this side, but on a planned occasion. 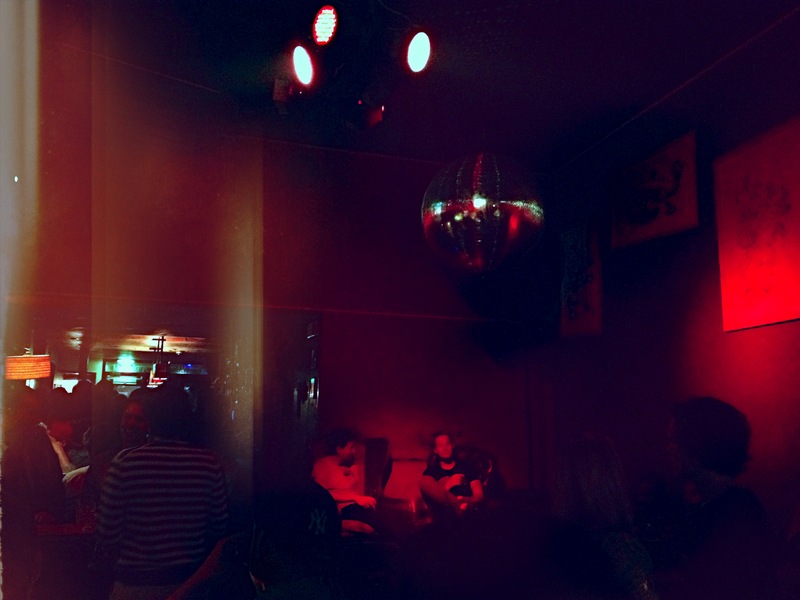 We ventured off to find Bloemenbar Nachtcafe, an incredibly cozy bar with tons of young Dutch people. Super “gezellige,” Dutch for cozy and quaint. We talked to some Dutch kids our age, one of which is studying to be a maritime officer. Who does that? The bar was playing Tupac’s “California Love,” so it felt just right. I particularly loved the flower diagrams/illustrations behind the bar, but couldn’t take a picture or I’d feel too touristy for such a hip place. 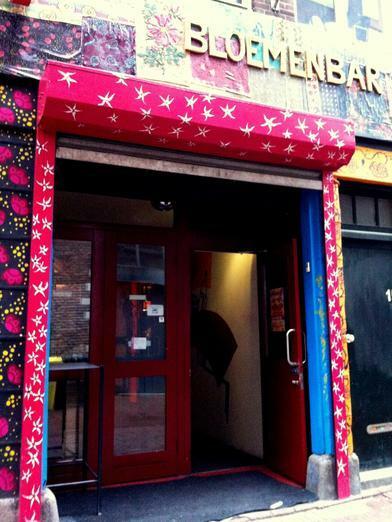 Bloemenbar exterior. 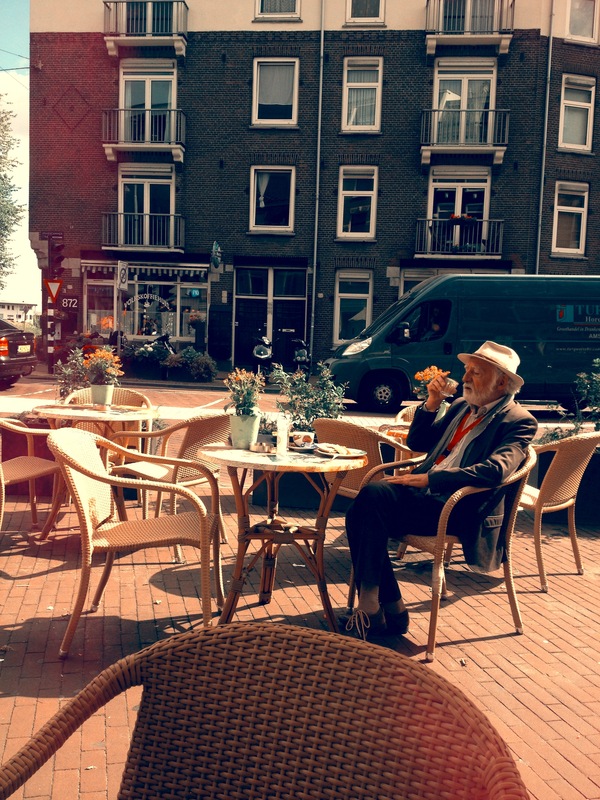 From my favorite website, http://www.awesomeamsterdam.com. Inside of cozy Bloemenbar, my own picture this time. For my online Pitzer class, my next assignment that’s due is a photo journal of things around the city that aren’t from a tourist view. I’ve decided to show the whimsical, cute side of Amsterdam that is such a contrast to the drugs/prostitutes/common impressions that people have of the city. I’m focusing on families and decorated bikes and fun things like that; I’ll figure out a way to share my final product on the blog. Must work on that today! Thanks for reading!